I’m not sure who loves horses more: me or Murphy. Whenever I come back from a barn, he can’t stop sniffing me, wagging his tail, or licking my boots. This is a dog that rarely wags his tail. He’ll do it when we have guests over or when he sees another dog, but Ryan and I have to work pretty hard to earn that loving gesture. Sad huh? I got the opportunity to visit the horses that my friend Muffy and I rode a few weeks ago. The snow was too deep to ride so we just made sure they were healthy, brushed the ice out of their tales, and loved them up. The sun was out, but the wind was blowing so it was colder than it looked. I dared to remove my gloves, however, and bury my hands deep in the woolly coats of the horses. I love winter horses. Their hair fills out to provide extra warmth making them fuzzy and irresistible. I took it one step further and leaned into the chest of Scooter. I was hesitant at first, not sure how he would respond (I didn’t want to upset a 1000+ lb. animal), but he didn’t seem to mind so I rested my cheek against his neck and instantly felt his warmth thaw out my frozen face and fingers. I could smell the sun in his hair and the hay from the large bale in the field where he had lunch. For a few moments, I didn’t notice the cold, the stress I had been feeling earlier in the day, or much of anything other than pure contentment. I once saw a picture of a dog resting his head on top of a horse’s nose. The look in their eyes was one of pure bliss, as if they were the best of friends and this was their form of a loving embrace. Murphy has only been around horses once, but it was love at first site. In fact, he began grazing in the backyard afterward. I know this is a common thing for dogs to do, but Murphy didn’t do it until he watched the horses chewing on grass in the field. At one point, we tried to get Murphy to come into the house, but one of the horses called to him as he walked away and Murphy went running back. I was so scared of him getting kicked, but Murphy had no such fear. He wanted nothing more than to be with the giants and act like one of them. When we left, he gave his new best friend a kiss on the nose. It brought tears to my eyes. Partly because it was so sweet, but also because I’ve never gotten one of those from my dog and I was really jealous! Animals can have an amazing presence in our lives. My neighbor keeps telling me that having a dog can lower your blood pressure. I point to all the holes in my yard and ask, “Really?” Seriously though, I don’t know what I’d do without my dog. When I need a moment of escape, I lie down on the floor next to him and bury my nose in his soft, fuzzy ears. Even on the days when he is in desperate need of a bath, the simple act of cuddling my dog can make the whole world disappear. And I was happy to discover that I got the same result when I hugged a horse. Lately, I’ve also learned that the act of baking can have the same effect. Reading a recipe and mixing ingredients can provide a similar outlet of escape for your brain. You are focused on measuring, pouring and anticipating the outcome. Especially when it’s a recipe you’ve never made before. There’s no room for outside worries when you’re elbow deep in flour and egg whites. And it’s a truly sweet escape when you’re making one of your favorite foods. Everyone has their go-to comfort food. Some people prefer meat and potatoes. Mine usually involves chocolate. And I’m not the only one. I have some friends in Chicago who read my blog and have tried some of the recipes. I know we are kindred spirits because they made the Banana Drop Cookies and had the same reaction I did: they need chocolate chips. I asked them what their favorite type of cookie is and they gave me a few options including Oatmeal Chocolate Chip, which was perfect because I just happen to have a few Oatmeal Cookie recipes in the box. They’ve been having a rough time (they too have had to deal with unemployment, only their experience has lasted over two years as opposed to my one) and I thought a little comfort food just might be in order to help raise their spirits. The recipe calls for 1 cup of nuts, but I substituted chocolate chips instead. I was only going to use half the bag, but I dumped the whole 12 ounces in there just for a little extra chocolately goodness. Also, the recipe suggests flattening the balls of dough with a glass, I don’t recommend that. I found that they cooked better and weren’t as thin if I left them alone. 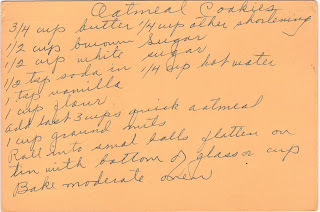 This is a great recipe to make if you really want cookies, but don’t have eggs in the house because it doesn’t use any. I thought that was weird, but I’m a baking novice so it might be more common than I think. I packaged up a bunch of the cookies and sent them off to Chicago. Then I also set aside a bag for Muffy as a “thank-you” for letting me tag along to cuddle horses. And I made a bag to stick in Ryan’s lunch container. He denies having a sweet tooth, but I have to believe that a homemade treat in the afternoon is a nice break in his hectic day. And once the dishes were washed and the kitchen was clean, I curled up on the floor next to my dog. He might not wag his tail for me every time I come home and sometimes he smells like sodden earth from his backyard excavations, but I cherish the moments I have with him. And if I can’t have a dog and a horse, then the next best thing is a dog who thinks he's a horse. And if you need a reminder not to over indulge in your favorite foods, here’s a picture of the barn cat at the ranch I’ve been visiting. I don’t worry about him staying warm this winter. The cookies were awesome. Thank you, Found Recipe Box!